Julia lives in a sprawling old house on the back of a gigantic turtle. When the turtle comes to a stop beside the ocean, Julia happily settles in. Unfortunately, her new neighborhood is a tad too quiet. So, Julia hits upon a plan: she hangs up a sign offering lodging to “lost creatures.” And, very soon, she has more houseguests than she can handle …! I fell in love with Hatke’s storytelling and artwork in his graphic novel series, Zita the Spacegirl. I was thrilled when I learned about his new children’s book, and kept an eager eye out for it at the bookstore. I was not disappointed when it finally arrived. 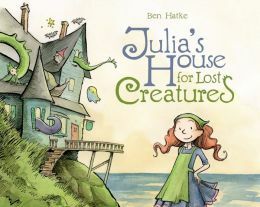 Julia’s House for Lost Creatures is a wonderful book: humorous, heart-warming, and beautifully illustrated. Julia is a great protagonist. She knows her own mind, and goes after what she wants — but she is also compassionate and kind. She likes an orderly home, but also welcomes the creativity and activity that a little chaos can bring to one’s life. The artwork is bright, but not glaring or garish: cheerful greens and reds and yellows, with thick ink lines. And the creatures: gotta love the Patch Up Kitty (a cat made of fabric scraps), the Folletti (basically, walking beards with a long nose and tall pointy hat), and the beautiful Mermaid with her wet, spiraling tail. I can’t say too much more without giving away the whole story. Suffice to say, this is an excellent book for anyone who loves strong female protagonists, or who needs to be reminded that the world is an odd, wonderful place. Highly recommended to children of all ages, especially fans of Hatke’s other work, The Courageous Princess by Rod Espinosa, The Paperbag Princess by Robert Munsch, and There’s a Princess in the Palace in RW and Zoe Alley.